Mission Obstetrics and Gynecology features a staff of four highly trained female physicians, each with an expertise in both obstetrics and gynecology. 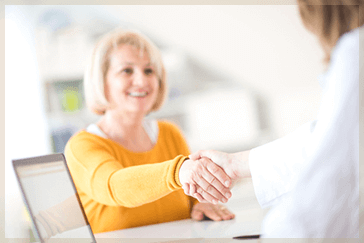 Our caring female physicians are board certified which means they have earned the credentials that you can trust. Together, our female Obstetricians, Gynecologists, nurses, and support staff offer a superior level of treatment and service for women by women, integrating state-of-the-art techniques with proven traditional methods of treatment. Most importantly, as women and physicians, our doctors genuinely listen to and understand your concerns and provide personalized care for your specific needs. Dr. Stephanie Paluda is a board-certified obstetrician and gynecologist. She earned her doctor of medicine from Wayne State University School of Medicine and completed her residency in obstetrics and gynecology at William Beaumont Hospital in Royal Oak, Michigan. Dr. Paluda is a fellow of the American College of Obstetricians and Gynecologists and a member of the Central Association of Obstetricians and Gynecologists. She has been recognized with several awards of achievement, including the Research Institute First Place Award, 25th Annual Residents and Fellows Research Forum from William Beaumont Hospital, and Young Investigator’s Prize from the Central Association of Obstetricians and Gynecologists Annual Scientific Meeting. Dr. Paluda was named to the Top Docs in Hour Detroit Magazine in 2005, 2006 and Best Docs by Styling Magazine in 2007, 2009, 2011, and 2013. She enjoys spending time skiing in northern Michigan with her family and three children, and she is an avid Detroit sports fan. Dr. Kristen Wuckert is a board-certified obstetrician and gynecologist. She earned her doctor of medicine from Wayne State University of Medicine in Detroit and completed her residency in obstetrics and gynecology at William Beaumont Hospital. She was honored by being named the Administrative Chief House Officer. Dr. Wuckert is a member of the American Medical Association and a fellow of the American College of Obstetricians and Gynecologists. She is also interested in minimally invasive gynecologic surgery and is trained in da Vinci® robotic surgery. Dr. Wuckert enjoys spending time with her husband and children, especially at the lake in the summer. She is an avid sports fan and has been a season ticket holder to University of Michigan football games for over 20 years. Dr. Caprice McGrail is a board-certified obstetrician and gynecologist. She earned her doctor of medicine from Wayne State University School of Medicine in Detroit and completed her internship at Hutzel Hospital in Detroit and residency in obstetrics and gynecology at Saint Joseph Mercy Hospital in Ypsilanti, Michigan. Dr. McGrail is a fellow of the American College of Obstetricians and Gynecologists and a member of the American Medical Association. She enjoys participating in resident education and lecturing. She is also interested in adolescent medicine and minimally invasive gynecologic surgery. Dr. McGrail enjoys cooking with her husband and spending time with her three children. A dedicated athlete and avid runner, she runs a marathon each year, hikes, bikes, and performs yoga. Dr. McGrail has also competed in and finished an Ironman competition. Additionally, she enjoys traveling whenever possible. Dr. Catherine Pokropek is a board-certified obstetrician and gynecologist. She earned her doctor of medicine from Michigan State University College of Human Medicine and completed her residency at William Beaumont Hospital. She is outgoing and brings excellent surgical and decision-making skills to her practice. Dr. Pokropek is a member of the American Medical Association and American College of Obstetricians and Gynecologists. She enjoys medical education and has received awards for her teaching. She is interested in high-risk obstetrics and minimally invasive gynecology surgery. Dr. Pokropek enjoys spending time with her family, traveling abroad, and cooking and tasting new foods. She is fluent in the Polish language and active in the Polish community.